Please refer to the installation instructions below. There are also several installation videos available. Can I install the tiles as soon as they arrive? The tiles must be allowed to acclimatise to the ambient room temperature beforehand. We recommend you allow 24 hours. If time is short, you can breakdown the pallet of tiles to help them acclimatise quicker. Installation should not take place at temperatures below 15ºC. PLEASE NOTE: If installation has to take place at a temperature below 15ºC, leave a larger expansion gap between the tiles and any fixed point and / or incorporate an expansion gap in the floor every 8 to 10 meters. We are unable to warranty installations that have taken place at temperatures below 15ºC. Can I install the tiles outside? No, the E500 cannot be installed outdoors. Fluctuating temperatures make PVC expand and contract. For external applications please use our Lifestyle range. No specialist tools are required, however to make your life easier, we recommended a measuring tape, a metal ruler, a rubber mallet or light hammer, a chalk line reel and cutting tools (if necessary). How do I cut the tiles? For cutting the tiles, there are several options. We recommend a guillotine for larger areas. You can also use an electric jig saw, table saw or a band saw with a timber blade. The tiles can also be cut with a Stanley knife, but this is more difficult than other methods of cutting. You can hire a Guillotine from us if you don’t have any of these tools available. Do I need to glue the tiles down? Loose Lay or Glue: In the vast majority of of ecotile applications no adhesive is required; the tiles can be dry laid and will take forklift or vehicle traffic without a problem. The tiles may require gluing if there is a risk of heavy point loading or shear (for example a three wheel electric reach truck with the batteries located over a small single back wheel or areas with tight turning circles). It may also be necessary to glue patches of tiles exposed to an isolated heat source such as a catalytic converter or furnace. Please contact ecotile for further advice. If the tiles are exposed to direct sunlight (loading bay doors, sky lights, windows etc). We recommend that the tiles are glued down. If gluing is required, we recommend you use Uzin MK92S. How do I prepare the existing floor for Ecotile? In many cases, there is little to no preparation required. Ecotile can be laid over damp and contaminated substrates. We recommend that you sweep the area to remove loose items. No repairs need to be carried out unless there are major cracks or missing pieces of cement. No skim coating, sealing or washing is necessary. Can I install these tiles over a painted, vinyl or carpeted floor? How do I install the tiles with under floor heating? Ensure the underfloor heating has been turned on and allowed to reach its usual operating temperature before you start installation. Lay the all of the tiles apart from the ones around the walls and fixed points. Leave them in the temperature of the underfloor heating for at least 24 hours before you cut the tiles up to the walls. Can you install the tiles for me? Yes, we have experienced installation teams available in several countries. There is an additional charge for installation. Do I need to use a sealant? No, you don’t have to use a sealant, however sealant will make future cleaning easier and will give your floor a high gloss appearance. 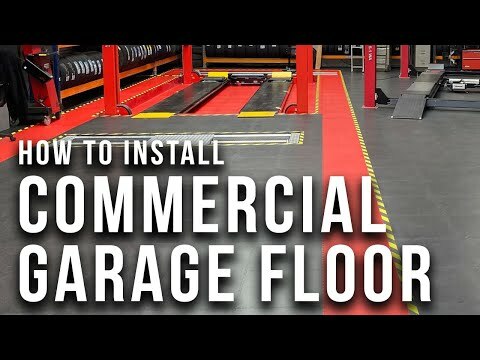 How do I install ESD flooring? How do I install tiles? Please refer to the installation instructs below. There are also several installation videos available. Yes, you can install the tiles straight out of the box. No specialist tools are required, however to make your life easier, we recommended a yard stick, a rubber mallet and cutting tools (if necessary). You can cut the tiles with a jigsaw, hacksaw or a bandsaw. No, the tiles are engineered with expanding joints. The floor will not move or change shape so no adhesives are required. Can I install tiles outside? Absolutely. Ecotile Lifestyle was designed to be installed outside and can withstand any weather or climate. Can I install the tiles directly over grass? No, if being laid on a grassy area, sand (stone powder) will need to be laid and compressed. Then on top, a geotextile (Tencate PP15) with a fine structure needs to be laid. The tiles can only be laid on hard surfaces. How do I prepare the existing floor for Ecotile Lifestyle? We recommend that you clean and sweep the area before you go ahead with installation. No repairs need to be carried out unless there are major cracks or missing pieces of cement. How can I paint or mark lines on my Lifestyle sports court? You can use cable strips to create straight lines between tiles. However, you will have to paint curved lines. Use a paint that will stick to polypropylene such as Maraprop PP. Clean the surface before it is painted. Use masking tape to mark out lines and paint the tiles with a small roller. At least two coats will be required. You can employ a professional line painter if you are unsure how to do this. How do I use Lifestyle cable strips? If you want to conceal cables run them along the side of a tile, install the cable strip over the cable. Simply connect another tile to the other side of the cable strip to completely cover the cable. Yes, we have a UK based installation team who can install Lifestyle for you. Installation fees are applicable. Garage flooring from Ecotile is tough and flexible, yet very easy to install. Just check out our video below! We recently installed ESD flooring in a large office. We take you through the installation step by step. Watch how we fit Ecotile interlocking floor tiles in this modern office This time-lapse video shows how interlocking flooring was used to replace carpet tiles in an office – in just 90 minutes!